The stress of moving can become overwhelming very quickly. Preparing in advance can help things run as smoothly as possible and save you valuable time and money. Your complete move out checklist provides reminders and helpful moving tips, allowing you to look like a seasoned professional. Make a moving notebook for planning your move. Keep your to do lists, budgets, and receipts in the notebook. You can also jot down research on moving companies, truck rental companies, cleaning services, and more. Contact local retailers to ask for free boxes. Many times grocery stores and retailers will share their boxes with you, at no cost. You may need to pick them up on a weekly basis in order to have enough so contact them in advance. De-clutter your home and closets. Have a garage sale or sell the items you no longer need or want online. The extra money can go towards your moving expenses. Purchase packing tape and markers as well as saving up all newspapers to use as packing material. If you don’t have newspapers, purchase bubble wrap or other packing material at this time. Begin packing items you will not use in the next two weeks. This can include items in guest bedrooms and bathrooms, wall décor as well as clothes and shoes not currently in season. Don’t forget any items in your garage or storage building that can be packed away. Choose your moving company and let them know the date you are moving. If you plan to DIY, contact your truck rental company and let them know when you’re moving and what size truck you’ll need. Inquire about costs and mileage fees in order to compare truck rental companies. Keep grocery shopping to a minimum so that you’ll have less food to pack or throw away. If possible, purchase items that will travel well such as canned and boxed foods. You’ll likely need extra trash bags just before and after everything is packed away. If you’re moving out of a school district, contact your child’s school to arrange to transfer their records to the new school. Some schools allow you to complete the process online. Check prescriptions and order refills if you’re running low. Finding time to refill your medications mid-move can make things more complicated. Change your address with the post office. You can change your address online. Contact your debtors to change your address with them. This includes credit card companies, banks, etc. Contact the utility companies to turn on / off your utilities. 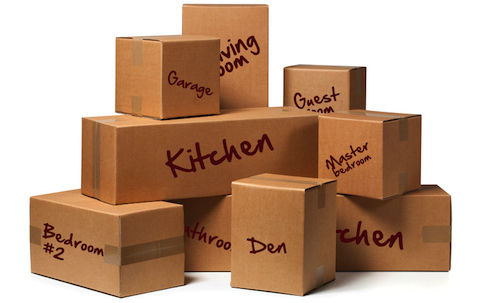 Label your boxes per room so that you or your movers know where to take the boxes once you arrive at your new home. This will help organize the unpacking process so that you don’t have to open and move the boxes later. Hire a professional cleaning company to perform cleaning services once you’ve moved out. If you’re taking your fridge with you, defrost the freezer 24 hours prior to the move. Pack a moving kit that includes daily essentials or valuable items that you want to keep with you. This includes items such as toiletries, glasses or contacts, expensive jewelry, medications, and a first aid kit, just incase. It’s not a bad idea to include a few paper plates, plastic cups, napkins and silverware. Keep this box with you or in the car so that you always have easy access to it. Let us know what ideas you have to making the moving process easier!